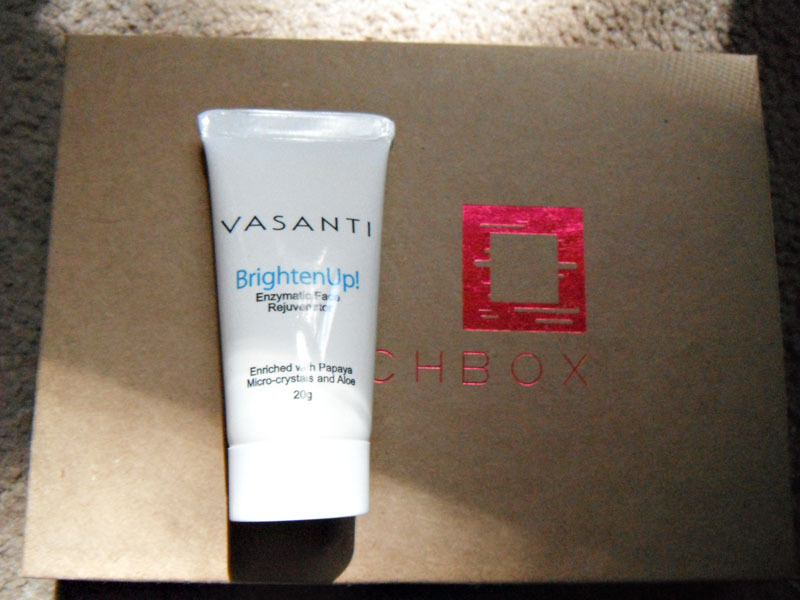 So, after last month's box, I had every intention to cancel my Birchbox subscription. In fact, I thought I had cancelled, but apparently I got distracted partway through or something, because I never actually finished canceling....so I was surprised to get a shipping notification this month. 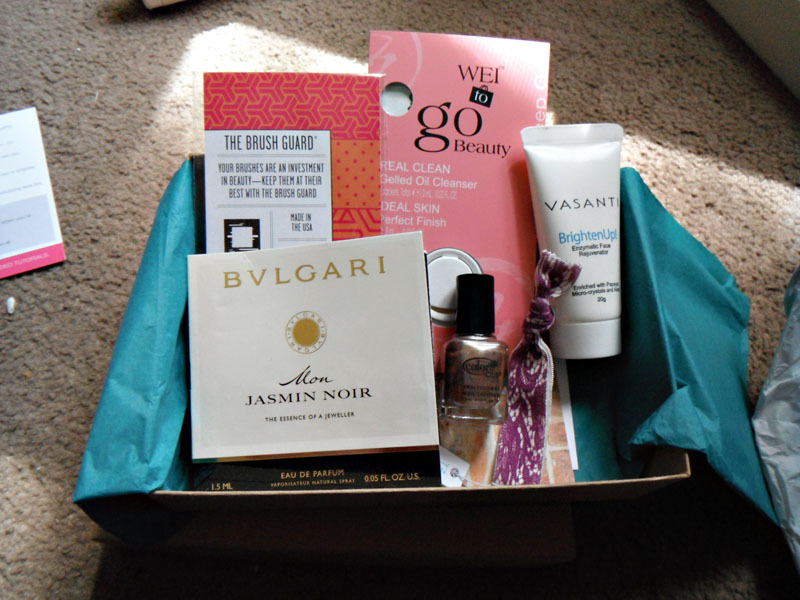 No big deal, just one last Birchbox. I was worried that it would be an amazing box, and I'd decide not to cancel after all. Luckily for me, that was not the case! The September boxes don't really have a definite theme beyond "The September Issue", and they've given us a collection of things that are at least vaguely appropriate for fall. So, what did I get this month? After last month's larger box, this one was back in its normal box and mailer. I was surprised to get my box today, as my shipping information had not updated. It was still pretty late in the month to receive my box, though. Birchbox did something new this month, and put together this cute little fall trend guide that includes ten of their favorite fall beauty trends. 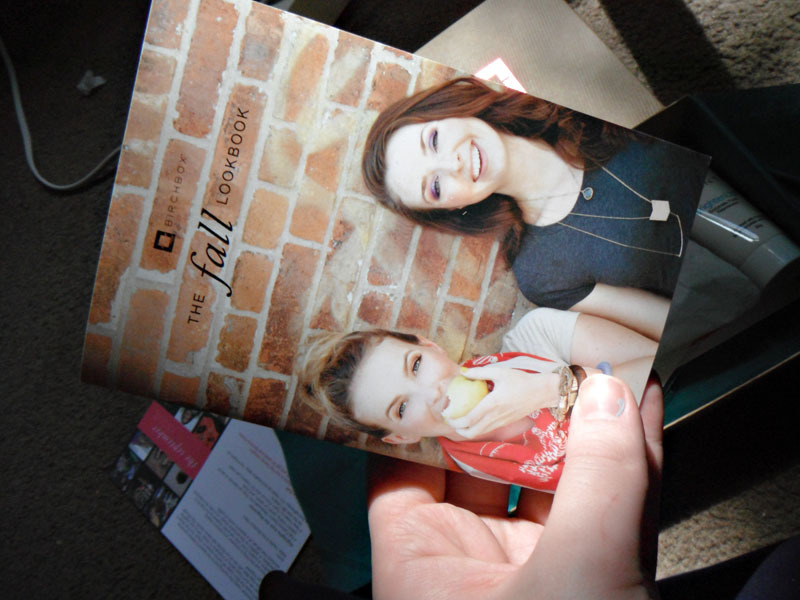 I really liked this little mag, it's a cute touch and I'd love something like this to be included more often! This is the Brighten Up! Enzymatic Face Rejuvenator by Vasanti. It's an exfoliating cleanser that uses microderm crystals and papaya enzymes to brighten the skin. It's a nice sized sample, and I look forward to trying it. This is a variety kit from The Brush Guard. 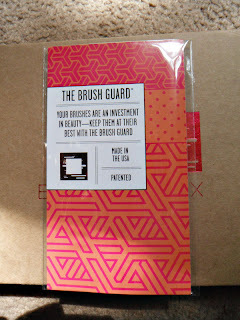 It includes 3 brush guards. They looked small, so I thought they'd just fit my shadow and liner brushes, but I was surprised at how much these stretch! I was able to fit my blush and foundation brushes in the larger two and a larger shadow brush in the smallest one While this isn't the most exciting product, they will definitely come in handy, as I usually just toss my brushes in a pouch. I see myself using these the most for storing my brushes after washing them...they seem like they'll really help keep them in order as they dry. This is the Sleep Over Kit by Wei. 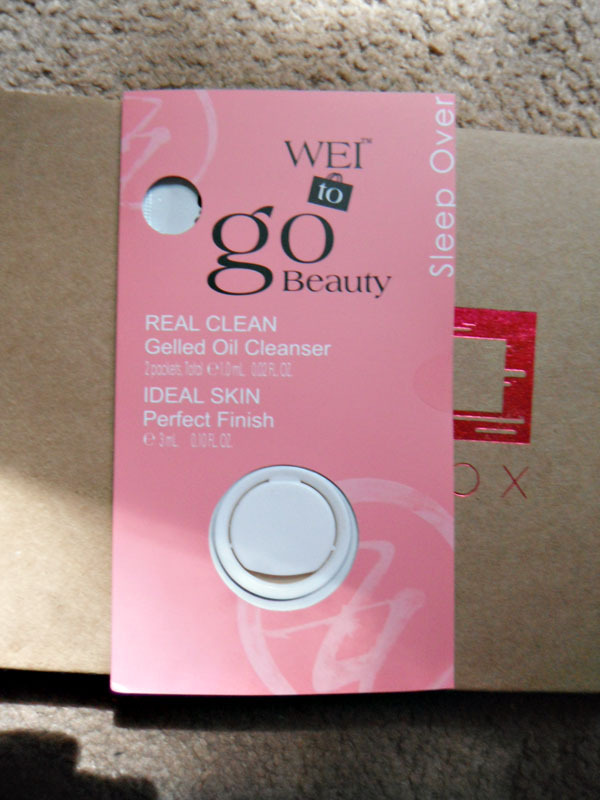 It includes two packets of gelled oil cleanser and a little pouch of a moisturizing face tint. 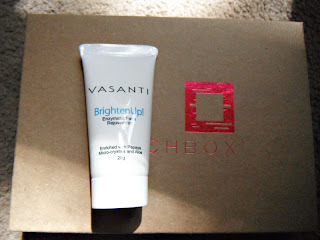 I am excited to try this, as I have never tried a CC (color correcting) cream and I am super interested. I will report back as soon as I try this! It looks to be enough for about 2 uses. 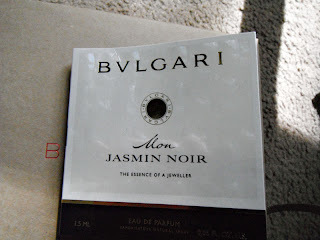 This is a sample of Mon Jasmin Noir Eau de Parfum by Bvlgari. I have mixed feelings on this. I have wanted to try Bvlgari, and this is definitely a high quality fragrance. That said, it's just not really my type of scent. It's a very sophisticated, sultry floral. I usually hate jasmine scents...I don't hate the jasmine in this one, I just generally prefer sweeter or fruitier scents. That said, I might give it a shot to wear for a day or two and just see how I feel about it after wearing it. 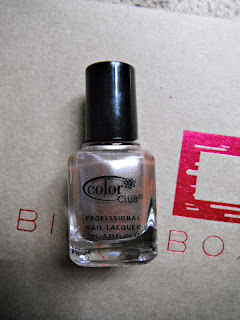 This is the biggest bummer of the box for me - Color Club polish in a rose gold shade. They scent out four colors this month - a cobalt blue, and slate gray, a chartreuse, and this one. They are part of a custom collection made for Birchbox by Color Club. I was hoping for anything BUT the rose gold...so of course, that's what I got. Luckily, many people wanted this shade, so I will be trading it! 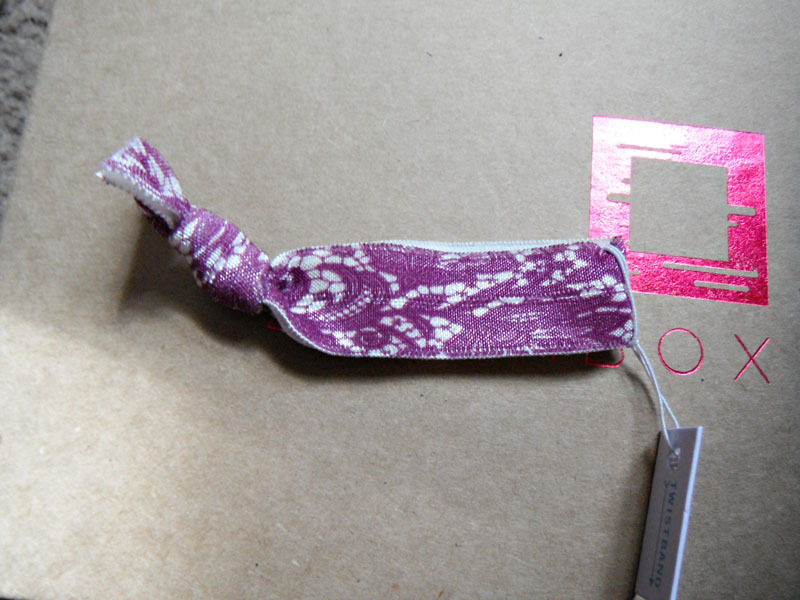 And this is my favorite thing in the box - a lace print twist band. Sounds silly, but these are the only type of hair ties I use and I think the lace print is super cute. In all, I'm not regretting my decision to cancel Birchbox. This is just an okay box, and nothing in it makes me truly excited. 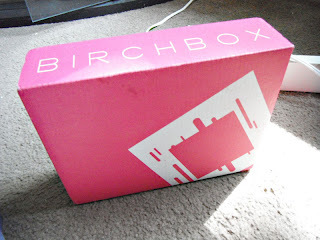 I started to get really underwhelmed with birchbox a few months back and canceled. 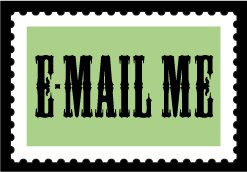 Stopping by from the Monday blog hop. The cleanser is definitely interesting! 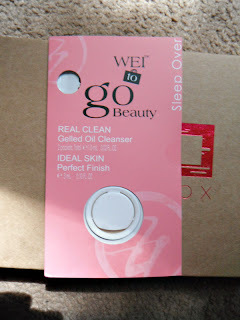 The exfoliating beads in it are truly TINY, it feels weird on the skin, but I like the results! They have definitely gone downhill, in my opinion! Luckily, I think some of the other subs have really been stepping it up. Thanks for the visit!